Milwaukee close reel long tapes deliver on best in class durability. They offer nylon coated steel blades that have minimal stretch for best in class accuracy. Milwaukee long tapes have industry's first debris wiper, Grime Guard, that prevents dirt, dust and debris from entering the tape, causing jams. Furthermore, reinforced 3:1 planetary gears and full metal frame guarantees durability in the toughest jobsite conditions. Milwaukee Tape Measures are Nothing But Heavy-Duty. Featuring Nylon Bond Blade Protection and a 5-Point Reinforced Frame, they offer the Longest Life by resisting contamination wear and increasing protection when dropped. To increase productivity on the jobsite, Milwaukee Tape Measures feature fractional scale for easy reading and optimized hook designed for scoring. For added utility, Milwaukee Tape Measures have stamped steel belt clips and are lanyard ready. 35-Feet. 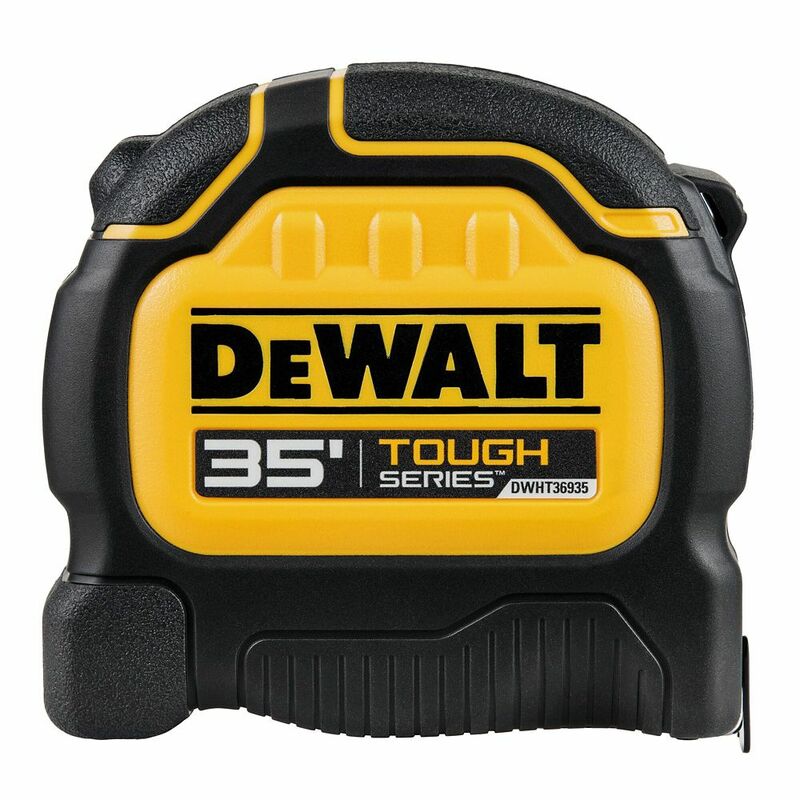 Tape Measure The DEWALT DWHT33976L 35-ft. Tape Measure is one of the toughest tapes on the market. This tape features Tough case durable case construction which means more rubber, more metal and 5 screws. The tough blade high carbon steel blade has a remarkable 13 ft. of standout. 35-Feet. Tape Measure is rated 3.3 out of 5 by 83. Rated 5 out of 5 by Mic from Replacement for a lesser tape I had. Glad to have a superior tool. Replacement for a lesser tape I had. Glad to have a superior tool. Rated 1 out of 5 by sheldon from no the tape is bent at about 7-8 inches out and flps over when trying to measure I am a contract... no the tape is bent at about 7-8 inches out and flps over when trying to measure I am a contractor and relies on my tools to perform quickly and flawlessly . Rated 3 out of 5 by Unhappy from Does not retract well. ... Does not retract well. Rated 5 out of 5 by Jackknife from This tape did what it said it could do. It will reach a little over 11" and the mag tipe works al... This tape did what it said it could do. It will reach a little over 11" and the mag tipe works almost to good. Rated 4 out of 5 by Tony from Heavy duty tape measure. No issue with retraction and smooth operation so far. It is a bit heavie... Heavy duty tape measure. No issue with retraction and smooth operation so far. It is a bit heavier than the Milwaukee 35 foot tape but it is well made. Clip works well and holds up nicely on belts or tool bags. So far, this tape measure has been quality. Rated 4 out of 5 by Cos from Haven't needed the magnet on tape yet. Happy with purchase.... Haven't needed the magnet on tape yet. Happy with purchase. Rated 5 out of 5 by Sheila from The other brands quit staying open or break. Haven't had a problem with this one and it is used 8... The other brands quit staying open or break. Haven't had a problem with this one and it is used 8 hours every day.